Researchers team from the National University of Singapore (NUS) has taken inspiration from underwater invertebrates like jellyfish to create the electronic skin with similar functionalities. Just like the jellyfish’s skin, the electronic skin is transparent, stretchable, sensitive to touch and has self-healing ability in aquatic environments. It could be used in everything from water-resistant touchscreens to aquatic soft robots. 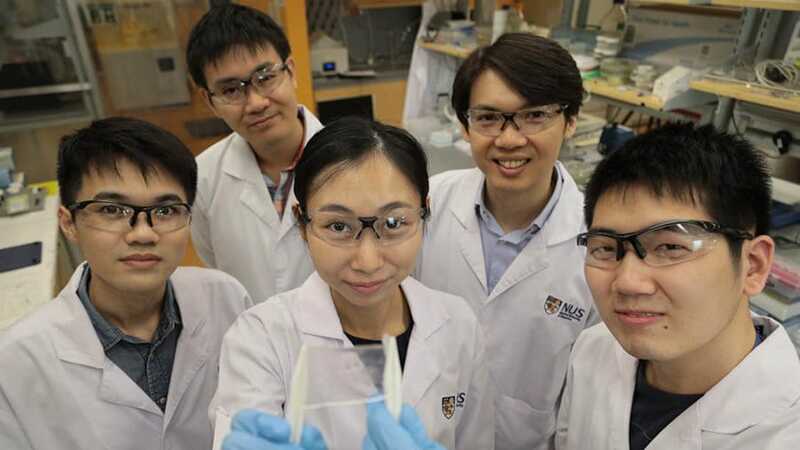 Assistant Professor Benjamin Tee and his team from the Department of Materials Science and Engineering at the NUS Faculty of Engineering developed the material, along with collaborators from Tsinghua University and the University of California Riverside. The team of eight researchers spend just over a year developing the material and its invention was first reported in the journal Nature Electronics on 15 February 2019. His experience in this research area led him to identify key obstacles that self-healing electronic skins have yet to overcome. “One of the challenges with many self-healing materials today is that they are not transparent and they do not work efficiently when wet. These drawbacks make them less useful for electronic applications such as touchscreens, which often need to be used in wet weather conditions.”, he said. “With this idea in mind, we began to look at jellyfishes – they are transparent and able to sense the wet environment. So, we wondered how we could make an artificial material that could mimic the water-resistant nature of jellyfishes and yet also be touch sensitive.”, added Asst Prof Tee, who is also from NUS’ Department of Electrical and Computer Engineering and the Biomedical Institute for Global Health Research and Technology at NUS. The electronic skin is created by printing the novel material into electronic circuits. As a soft and stretchable material, its electrical properties change when being touched, pressed or strained. “We can then measure this change, and convert it into readable electrical signals to create a vast array of different sensor applications. The 3D printability of our material also shows potential in creating fully transparent circuit boards that could be used in robotic applications. We hope that this material can be used to develop various applications in emerging types of soft robots.”, Asst Prof Tee added. Soft robots and soft electronics in general, aim to mimic biological tissues to make them more mechanically compliant for human-machine interactions. In addition to conventional soft robot applications, this novel material’s waterproof technology enables the design of amphibious robots and water-resistant electronics. Asst Prof Tee and his team will continue their research and are hoping to explore further possibilities of this material in the future. “Currently, we are making use of the comprehensive properties of the material to make novel optoelectronic devices, which could be utilised in many new human-machine communication interfaces.”, he said.